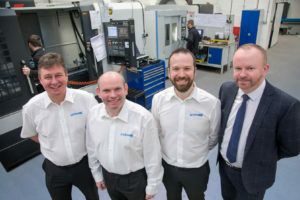 Over the last 2 months, we have been collaborating and working with Hyfore, a leading UK workholding specialist to unveil a new digital enterprise and brand as a part of Hyfore’s three-year objective to expand and grow their business. Currently operating under a parent group – Hyfore came to us with a desire to promote a completely independent brand and identity, and launch a new product offering: the Hyfore Shop. As a result of our expanding footprint within the engineering community, we were approached by Gary Dickenson and Darren Underhill (UK Managing Directors) seeking consultation on this new direction for the business. Following due creative process, we established an understanding of the already fantastic work Hyfore are doing through briefings, developed a value proposition and presented a marketing plan which would enable accelerated growth. This included the design and development of a bespoke website showcasing the cutting-edge technology piloted by Hyfore. Thanks to the collaborative relationship established, we worked to an astounding 3-week inception-to-delivery timeframe, we walked the business through a professional rebranding, design and development of a new responsive website. Other services delivered also included logo design, branding, signatures, full colour company brochure, company apparel, exhibition stand design, e-commerce website with 100,000+ products, company website, amongst others. We’re due to commence a digital social campaign to expand Hyfore’s reach and hopefully result in further business growth. Visit Hyfore’s new website here. Is your business in a period of growth or change, but with no firm marketing or digital strategy? Contact our account management team on 01926 298 777 to discuss how they can help accelerate your business’ performance through leading digital initiatives and flexible service offerings.